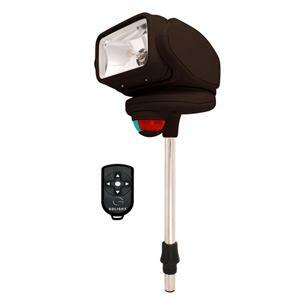 Portable, safe, and easy to use, this remote-controlled bow light attaches quickly and securely to any 2- or 3-pin bow socket. Bi-color navigational light kicks out 1,000 lumens of bright light from its position atop the 12" stanchion. Remote control features 16 security settings. 360 degree rotation, 90 degree tilt. Also includes a heavy nylon case.